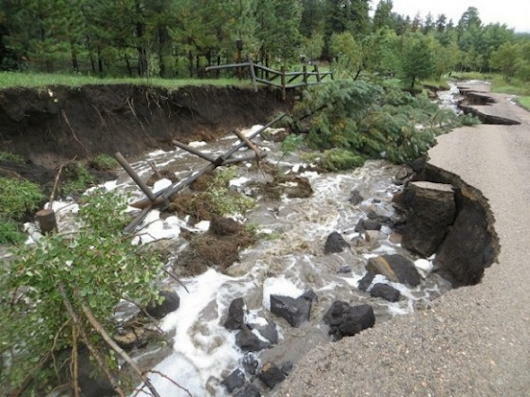 Results of the September 2013 Northern Colorado Flood. September 10: Board Meeting at 7:00 PM. Members are welcome to attend any board meeting. Check with a Board Member to find out where the meeting is being held. September 12: Flaming Gorge/Green River Fishing Trip: Three day fishing trip to the famous Green River hosted by Jim Booth. Specific days and times will be determined on participants’ needs. See our Fishing page and contact Mark Miller to sign up and for additional details. This is a trip not to be missed. As members of Trout Unlimited, we can have a say in the upcoming Colorado Water Plan. A meeting has been scheduled at the Fort Collins Senior Center on Wednesday, September 17 from 1 p.m. to 4 p.m. [Note: This is at the Senior Center, the afternoon of the first RMF General Meeting of the year with Steve Schweitzer. Do both.] You can find more information at the Colorado government web site and the Colorado Water Plan site. September 17: Steve Schweitzer previews A Fly Fishing Guide to the Indian Peaks Wilderness . From a hike to Columbine LakeOpening our 2014-15 general meeting season, Steve has been a regular presenter at Rocky Mountain Flycasters’ meetings for good reason. 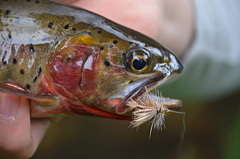 He has been a regular fly tier at our February Fly Tying Expos, and general meeting presenter. The previous visit introduced his book A Fly Fishing Guide to Rocky Mountain National Park, a great book exploring our nearby gem of the Rockies. This month, Steve will give us a preview of a forthcoming book A Fly Fishing Guide to the Indian Peaks Wilderness, that he is co-authoring with Michael Kruise, owner of the Laughing Grizzly Fly Shop. The book promises the same detailed analysis of lakes and streams to the wilderness just south of Rocky Mountain National Park. We’ve heard that the book will be released in October, so join us for this sneak peek. Be sure to check out the Flyfish the Peaks Facebook page for a peek at Steve’s book and presentation. A man of many talents, Steve will also be our fly tier before the meeting starts. Arrive early for Steve’s double-feature. First meeting of the season. Social hour begins at 6:30 pm at the Fort Collins Senior Center, and the program follows at 7:00 pm. We will have a local fly tyer at each general meeting and an equipment raffle following the meeting. Admission is free and the public is welcome. The Fort Collins Senior Center is located at 1200 Raintree Drive off Shields Avenue between Prospect and Drake. Additional meeting information. September 20: Blue River See our fishing page and contact Mark Miller. Fishing trip host is needed. 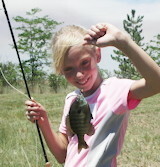 CYO and Colorado Division of Wildlife have sponsored an outdoors skills day for several years at Swift Ponds. This is a great opportunity for youth to learn outdoors skills, shoot guns, arrows, and experience catching fish. RMF has always provided volunteers to introduce fly fishing. While parts of the event are still being planned, you can contact Dennis Cook, RMF Youth Coordinator to help in assembling a volunteer crew. Rocky Mountain Flycasters will again participate in the Larimer Boys and Girls Club Day for Kids Festival. This annual event is a great opportunity for youngsters to see what kinds of community activities are available for participation. RMF will have volunteers including 1-2 fly tiers, knots board/teacher, casting coaches and greeter who will explain TU, RMF and our programs. Further details will follow. To volunteer for this event, contact Youth Outreach Chair Dennis Cook. Rocky Mountain Flycasters/Trout Unlimited River Trail Leaders will work with a team of volunteers to mow vegetation in the trail, trim back trail-side vegetation, and rebuild rock cairns marking safe river crossings. Afterward, volunteers will be able to do some catch-and-release fishing in the canyon. See the Phantom Canyon Page for more details and volunteer signup contacts. There is no backup date for the September Stewardship opportunity. Training session for volunteers to assess 2013 flood damage to Arapaho-Roosevelt National Forest streams. This assessment will provide data to lead recovery efforts in our forest. A Longmont location will be announced soon for the 6:00 pm - 8 p.m. training session. See our home page for more information and contacts.